Co-owners Jessica Oh and Chi Moon welcome diners of every stripe with a hipsterish ambience, a detailed English-language menu that features infinite possibilities for customization, and a huge quantity of vegan and vegetarian options. 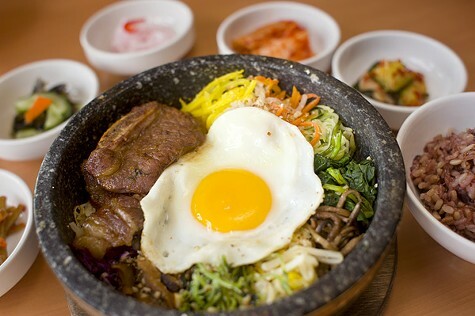 Along with fleshy faves such as Korean BBQ and beef tartare, Bowl'd also offers meatless stews, meatless bibimbap, meatless small plates, and more. Kimchi is made fresh daily here, and finds its way into banchan side dishes, a fabulously intense fried rice, and a kim chi stew served in a helmet-size, too-hot-to-touch stoneware dolsot pot brimming with cinnabar broth, stretchy clear sweet-potato noodles, chewy rice-cake "petals," onions, beef bits, and a Sargasso Sea of fiery fermented cabbage. It's comfort food, but Korean-style comfort can be as spicy as you like. Organic produce can be used in some dishes on request. Albany restaurant takes the intimidation factor out of Korean cuisine.